Power picker Daniel Mason, a player with Hank Williams III, fell in love with his new Renaissance Vintage. This new model from Nechville combines the modern elements that they are known with the look of an antique. Tarnished copper and bronze metal parts and an artificially aged head give that 1930’s vintage look. The modern features for such as the elegant Heli-Mount frame, tunneled 5th string and compound radius frets add to the instrument’s playability and ease of adjustment. On the contemporary side, Winfield champion Steve Moore picked up his first Nechville, a custom straight neck Phantom. Rather than having a short fifth string or a tunneled fifth, this neck has a full length fifth string. The fixed position of the fifth string can be moved anywhere he chooses between the zero fret and the twelfth. Steve is enthused about all the new inspiring ideas that are coming from the addition of those five extra notes to the banjo neck. Riley Mathews, another Nashville area talent, settled on Nechville with all the modern conveniences but in a bit more traditional style. The new Photon model retains the shape of the popular Phantom neck with hidden 5th string tunnel but with old time inlays and the traditional look of a shiny nickel plated Heli-Mount frame. 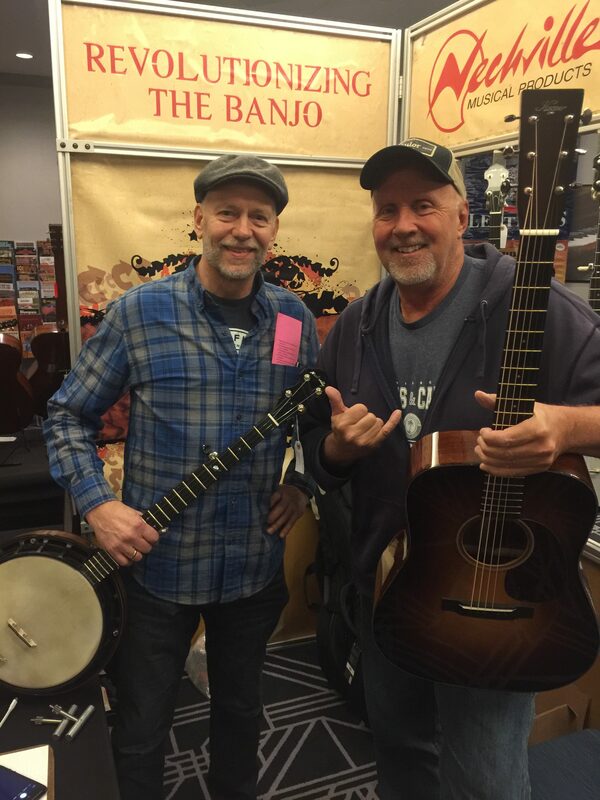 Pete Wernick banjo instructor Gilbert Nelson also joined the Banjo Revolution team. He picked up his first Nechville at the show. Gilbert liked the neck form the Photon, but chose the black Eclipse Heli-Mount body of another model. Only with Nechville can you easily switch necks from one banjo to another in just seconds. Many players have heard the Nechville name. But not as many have had the experience to meet Tom Nechville in person to gain full comprehension of his design and the many improvements he has introduced to the banjo world. 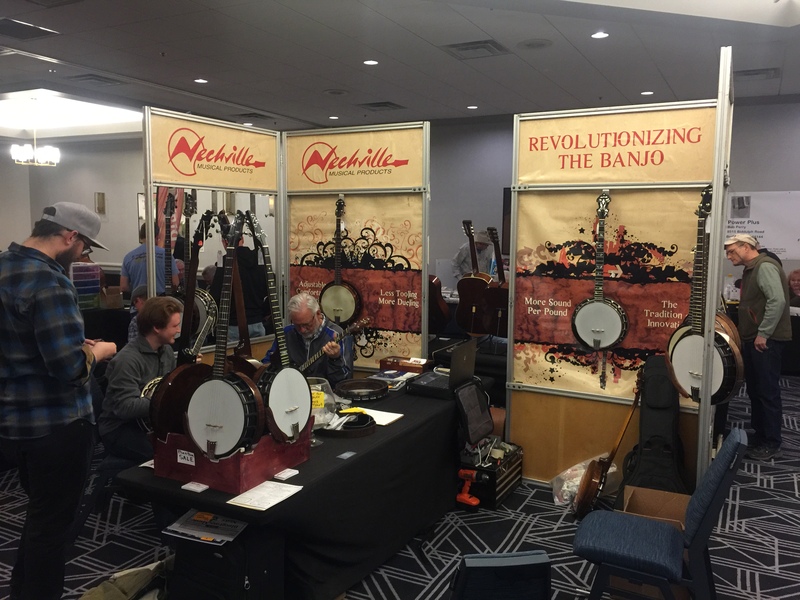 The Nechville display appears at major festivals all over the US and each summer at La Roche Bluegrass festival in France. Nechville looks forward to his first trip to Japan hopefully in the coming two years. The excitement over Nechville continues to grow as happy customers earned over the past thirty-plus years continue to grow in numbers.